In the Roanoke Region, you have direct access to three interstate highways, the Port of Virginia, and a regional airport. The Roanoke Region is all about location, location, location. 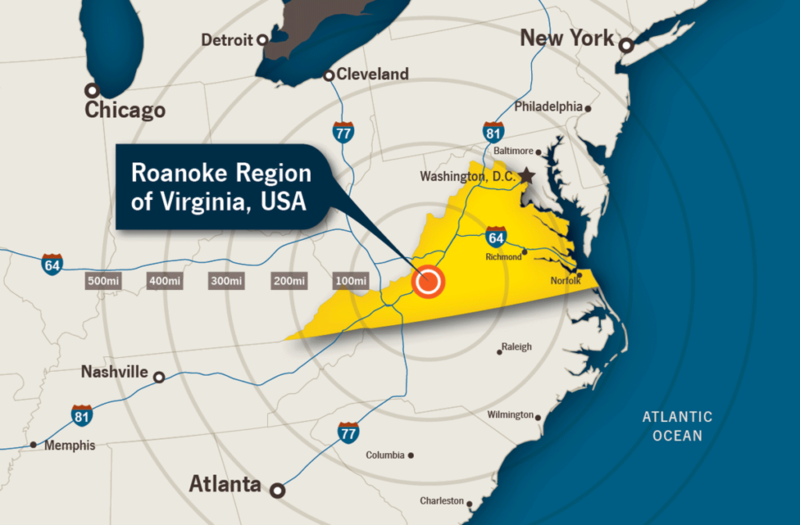 Equidistant between New York and Atlanta, the Roanoke Region is centrally located to major cities in the eastern United States. Advance Auto, Elizabeth Arden, Orvis, and other companies that must get their products to market are located here because of fast and cost-efficient shipping to two-thirds of the U.S. population within a day’s truck drive. Location and logistics are strong advantages of the Roanoke Region. The area is served by a Port of Entry and Foreign Trade Zone to save time and money for companies importing materials. A large UPS hub is located here and the region is served by major air freight and package express companies. Evidence of the region’s reputation as a logistics hub is the approximately 70 trucking lines serving the area with local, state, and interstate service. Whether traveling domestically or internationally, the Roanoke-Blacksburg Regional Airport can get you there. Non-stop connection services are provided through the major airline hubs, making travel to and from the Roanoke Region convenient. The Roanoke Region is served by Norfolk Southern and CSX for freight. The region is located on the Heartland and Crescent Corridors of Norfolk Southern. The Heartland is a direct, high-capacity route that spans from the Port of Virginia to distribution markets in the Midwest. The Crescent spans 11 states and is one of fastest, most direct routes from the Southeast to the Northeast with convenient connections to Mexico and Los Angeles. An I-81 intermodal facility is planned for the region. Amtrak provides passenger service to Chicago via Clifton Forge and to points in the Northeast (Washington D.C., Philadelphia, New York, and Boston among others) from the station in downtown Roanoke.